As a way to learn more about the history of science fiction, I am reading my way through some of the classics. This week, I read Utopia, by Sir Thomas More, (which, btw, you can get for free from the awesome folk at Project Gutenberg). Utopia, which Thomas More published way back in 1535, was the first of a species that later evolved into some of the most popular and most disturbing dystopian stories ever, including Aldous Huxley’s Brave New World, H.G. Wells’ The Time Machine, George Orwell’s 1984, Ray Bradbury’s Fahrenheit 451, Anthony Burgess’ A Clockwork Orange, and Margaret Atwood’s A Handmaid’s Tale. Most people say the official birth of science fiction was 1818, via twenty-one-year-old Mary Shelley, so Utopia is more like proto-science fiction. 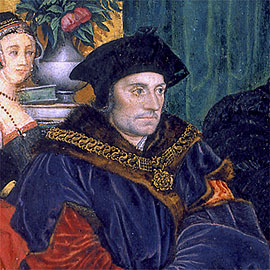 The author, Thomas More, was a statesmen and lawyer, which is not the worst career to have in corrupt, chaotic, sixteenth-century London. He was privileged, but also a bit of a monkish humanist (he wore a hair shirt and whipped himself on Fridays, as you do, and he refused to take on dodgy cases or charge people in unfortunate circumstances). He also had a pretty liberal attitude about the education of women: in an era when the idea of educating women was still thought absurd, he thought they should be treated just like the lads, and so he taught his wife and his daughters himself. Some of his thoughts on the state of the world show through in Utopia, which is more of an exercise in world-building than a straight narrative. It’s also quite cutting, but it’s hard to say for certain how much is satire and how much is faux-satire (to avoid insulting his powerful friends), and that’s probably exactly how he intended it. Some of the more interesting ideas in Utopia are still controversial today, like treating euthanasia as a dignified and honorable death, or treating atheists like regular human beings. In More’s fantasy country, society attempts to be fair, controlled and ordered, all things he genuinely pined for in London. The Utopians live in a harmonious, rational and open society where wealth and fortune (even children) are shared. People wander in and out of each other’s homes freely, women are educated and can become priests or soldiers if they want, and kings and princes swear an oath never to hoard riches and busy themselves with the art of peace, not war. Citizens don’t even need to worry about the gross jobs like clearing away waste or butchering animals for food, because criminals or immigrant volunteers do that stuff. Adultery is considered a criminal offence and divorce is almost as bad, so before marriage couples are paraded before each other, naked, to make sure their clothes aren’t hiding any “contagious” or “loathsome” surprises that may “alienate a man from his wife, when it is too late to part with her.” Yes, really. Some critics point out that while More gave equality to most people in Utopia, he also gave every family a slave. However, these “slaves” are either poor volunteers from neighboring countries (free to leave whenever they wish) or criminals who have broken the simple rules of Utopia. I’m not sure we People of the Future, who just jam our desperate immigrants and criminals into cages instead, can really judge him for preferring communal labour. Another popular criticism is that while the citizens of Utopia are tolerant of many religions and believe “no man ought to be punished for his religion,” they don’t consider atheists fit for human society. Atheists are apparently of “base and sordid minds” and “scarce fit to be counted men, since they degrade so noble a being as the soul, and reckon it no better than a beast’s.” They are not allowed to hold honors or offices or be employed in any public trust. OK, so this is totally backward and prejudiced, but come on … 500 years later in our futuristic societies of flying ships and global knowledge, even the most “civilized” of our countries still carries on with this dark-ages bigotry. Just sayin’.